Yoshi Circuit is the third racecourse of the Star Cup in Mario Kart: Double Dash!!. It reappears as the fourth race of the Lightning Cup in Mario Kart DS as well as in Mario Kart 8 and Mario Kart 8 Deluxe as the first course in the Egg Cup. The course is unique in that it is shaped like Yoshi himself, making it the only track in the Mario Kart series to be shaped after a playable character. Many turns are in the course, including a particularly sharp hairpin turn located at Yoshi's "tail". There are also many Piranha Plants at the sides of the road, nipping at racers who get too close. The race first starts at the straight road under Yoshi's "shoe." As the racer progresses for a little bit, the player will make a slow curve to the right. Piranha Plants are present on the grass on the right of the course, and to the left, there is water that will stop the player in their tracks if fallen off. Past the curve is a short straight road and a turn left. After the turn left is another straight road and soon, another curve to the right, which would be going around Yoshi's "hands". After the "hand" curve is a straight road, and another turn to the right that leads to an overhang, which starts a large curve around Yoshi's "nose". Inside the curve in Yoshi's "nose", the player is protected by walls to the right to prevent them from falling into the water. Past the long curve to the right in Yoshi's "nose" is a sign that the player will see to turn left, obviously initiating for the player to turn left. The player will then make a shorter curve to the right around Yoshi's "eyes". Past Yoshi's "eyes" are his "spines", which are small and short curves around circular flowerbeds which won't pose the player much of a problem if the player correctly drives straight. Past the orange flowers is a Piranha Plant, and past that Piranha Plant is a slight downhill change of terrain and a U-turn to the left. Past the U-turn is a small incline and a straight road, as one is progressing the "tail." On the tip of the "tail" is a U-turn to the right and a straight road. The straight road leads to a turn to the left and three Piranha Plants. Past the Piranha Plants is a turn to the right and a straight road, indicating that the finish line is just in front of the player and starting the cycle of the course again, but on the next lap. There are three shortcuts. After the first left turn, if a player gets a Mushroom from an Item Box, they can use the Mushroom to jump over the moat, not having to maneuver around Yoshi's "hand". It is also possible to do this without a mushroom, instead using a well-placed powerslide. In the DS version, however, the shortcut can be done with a well placed jump over the moat if the player is using a high acceleration kart. The second shortcut comes right after the tunnel, and it requires the player to use another Mushroom to propel themselves from the course into a tunnel, which emerges into a straightway. There are also Double Item Boxes in the tunnel. This second shortcut is removed in both DS and Wii U versions. A third, minor shortcut can be performed by boosting behind the Piranha Plants through the grass before the finish line. 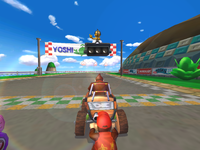 Some edits have been made to the course for its reappearance in Mario Kart DS. One of the most significant changes is that the Piranha Plants are no longer in Warp Pipes and bite at racers that drive too close, instead being the small, constantly-biting variation that is seen throughout other courses. Another somewhat significant change is that the number of "spines" on the back of Yoshi's "head" have been reduced from three to two and the second shortcut being removed. Some minor graphical changes that do not impact gameplay include Yoshi's "fingers" not being there, the windows in the tunnel being larger, Yoshi's "cheek" being made of sand instead of water, the helicopter not being present, and the banners near the finish line being removed. The course was available in Wi-Fi. Yoshi Circuit appears a second time as a retro track included with The Legend of Zelda × Mario Kart 8 downloadable content in Mario Kart 8, and as part of the core game in Mario Kart 8 Deluxe, as the first course in the Egg Cup. Many changes have been made in this version of the track. The "shoe" is now a small town near the starting line, with a dock, several small islands and sailboats nearby. The course banner now resembles an archway connected by two street lights, with two sets of flower bouquets on both sides and a ornament of a Gold Yoshi posing on top of a sliver and gold Yoshi Egg. The Mario Kart logo on the starting banner is the modern design, instead of the classic one used for most of the retro courses between SNES and GCN in the game. GBA Cheese Land and GBA Ribbon Road also use this design. The Piranha Plants before and after the starting line have been removed and replaced by tires similar to the ones on GBA Mario Circuit, while the ones in the "spines" have been re-positioned. The Yoshi Helicopter has been replaced by a green Mario Kart TV helicopter, from the view above the course. The second shortcut has been removed entirely similar to the DS version; this time, the path is entirely blocked with guard rails. The first shortcut now has a waterfall which players must drive through. Players can now perform tricks off the grass ramp at the first shortcut if they are fast enough. The "saddle" now acts as a place to shade spectators. Also, a sign saying "Yoshi Tunnel" can be seen on both ends of the tunnel around the "nose". Also the course is more straight and the dips and inclines at the "spines" and the "saddle" have changed. Red Yoshi on the B Dasher kart with Standard tires and the Super Glider is the Staff Ghost for this course. The new, live-recorded background music was rearranged with new instruments including guitar, saxophones, and drums. Official European website: "You wouldn't know it unless you looked at the track from above, but Yoshi Circuit is shaped like the lovable green dino himself. Tight turns, tunnels and treacherous waters about in one of the toughest courses of the tournament. But by now, you're ready for that, right?" Tanooki Mario, performing a trick on the ramp underneath Yoshi's "shell"
The Daisy Cruiser can be seen in the background of the Mario Kart: Double Dash!! and Mario Kart 8 versions of this course. However, if Mario Kart: Double Dash!! is played via split-screen, the Daisy Cruiser will not be there. The Sunshine can be seen in the background of the Double Dash!! version of the track. In Mario Kart 8, one of the Yoshis in the audience will occasionally hum Totaka's Song. This also occurs in other courses with Yoshis in the audience. In Mario Kart 8, the Standard Kart and Yoshi Bike can be seen in the garages by the starting line, as well as Standard Tires and ? Blocks. This is one of two tracks in the series not from Super Mario Kart that appears in more than two Mario Kart games, the other being Baby Park. Both of these tracks debuted in Mario Kart: Double Dash! !, reappeared in Mario Kart DS as retro tracks, and then returned as DLC in Mario Kart 8. This track shares the same music with Luigi Circuit and Mario Circuit. A remix of the music for these courses appears is available as a track that can be heard during events in Mario & Sonic at the Sochi 2014 Olympic Winter Games. In Mario Kart 8, it is one of only two courses that does not have any Dash Panels, glider pads, underwater sections, or anti-gravity sections, with the other being SNES Rainbow Road. Coincidentally, both of these courses are part of DLC Pack 1. ↑ GameXplain. (January 12, 2015). Totaka's Song in Mario Kart 8 (Secret). YouTube. Retrieved September 10, 2017. This page was last edited on March 27, 2019, at 23:47.